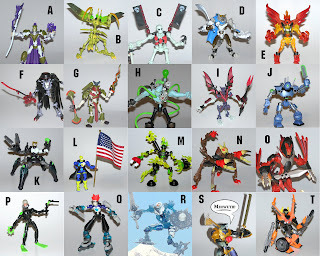 Xevoz - Alpha Ranger - I forgot one! I forgot about the Alpha Ranger! 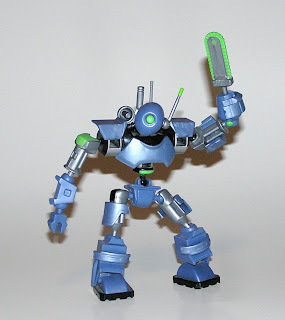 The Neo Sapien with a ton of armor and weaponry. I added some bandage decals, for it seemed he needed them. I guess I will label him 'U' for the Xevoz Challenge, that many of you are spending days constructing the perfect figure for me to build. Don't forget to comment those ideas! I am really that bored! Speaking of Rangers, I was at Eagle Island State park yesterday. What a perfect place to have someone dress up as a monster and wreck chaos. The monster could knock over grills, steal beach toys, and kill people. Then have a group of people dress up as Power Rangers and then go kill the guy dressed as the monster. The place has a perfect park/quarry feel. And when the Zords come out, the city is far enough for it to seem really awkward that one minute you're in a park and the next minute you are in down town Boise. Ooooh look a 12" Flint! Maybe this picture will help clear up the text message I sent to my sister. Wow, how cool is this toy? It will certainly be top five of the year 2008. I think I know own four Flints, but I will have to verify for another post. Too bad he doesn't have voices from the original cartoon, like the voices I still hear in my head. I'll have to open him up right this second, and do a follow up post for sure on this guy. Hope he isn't too rare. Next buy; the 12" Cobra Trooper. Xevoz - Mario! 's design, I like those arms! Very funny design Mario! 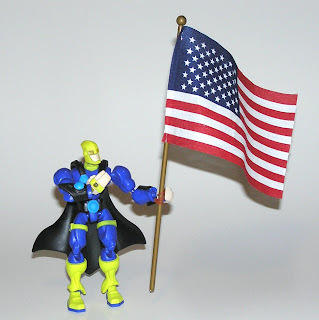 I do like the flag arms, they are great! I can just imagine it waving them frantically; "Pay attention to me! Pay attention to me!" Darn, I tried to loop a quick .gif animation on the page but it won't work. If I drag and drop the file into the browser it works. Is this a blogger no do thing? I was successful long ago with Lego Emperor, but it only worked for a short time before I messed it up. Any ideas, web geeks? Already the first entry has been created! Danage Slayer aka Bryan from work designed this neat little fellow. I bet it likes long walks on the beach and wearing flowers in the winter time. Nice job, good balance of species, not too over the edge. 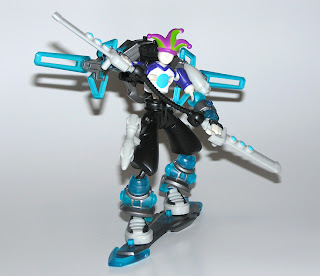 You can really get an idea of how cool these Xevoz can intermix with each other. So, who's next in line in creature creation? I'm waiting for instructions. Don't be afraid to ask me to photoshop a text bubble that says something appropriate, or some other cheesy effect. For the last few weeks I have subliminally introduced Xevoz into your deepest cavities. Sadly though, I doubt you have the same reckless action figure collecting bug that I do, so playing with Xevoz is impossible for you. This is where the Xevoz Challenge comes to play! 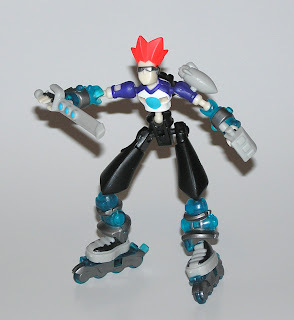 All you have to do is pick which figures you want me to disassemble, then what parts you want me to build with, and then I will create your creation and take a picture for all to see! Weeee! For Example; "Duh, I'll take the Torso of C, with the Legs of R, and the Head of J, with the weapons of E." -I will then take those parts and pieces and custom build your creation and photo it for all to see! 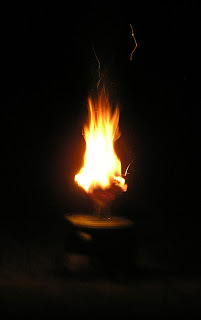 Lets try not to go too crazy, keep it close the example above, and only one comment creation at a time. I expect millions of submissions, so we have to be fair. Also, if this gets really crazy. 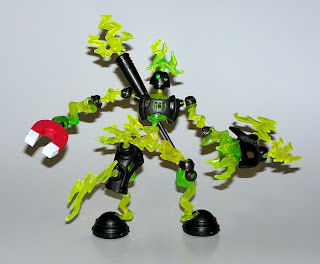 I will introduce you to the Xevoz game, where each of your pieces correspond to a Xevoz power Glyph and Helix roller. We will then choose which of the coolest creations to fight against each other in a battle of ultimate destruction. So What are you waiting for? What should I build first? 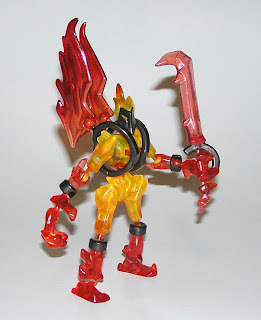 Xevoz - Inferno Fury - He must be a liar because his pants are on ____! I was going to do this whole silly Photoshop bit where Inferno Fury starts burning the poster board he is standing on, then engulfing my couch, and then my arms bursting into flames, but I just got extremely lazy. 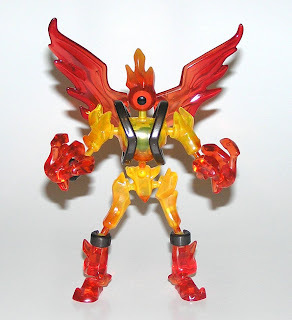 Inferno Fury is one of those Xevoz that as soon as you see him in the other figures section on the packages, you know he is the next one to buy. 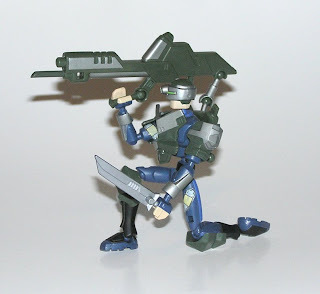 Top five for sure, he has more of that pretty clear plastic, loads of weapons (one that shoots about a few inches! ), swords and staffs, and cool eye ball head. And those neat wings sure are spiffy hot. Sniff Sniff, I think I have exhausted my Xevoz collection to show off. I do have that one that turns into a car, but it's quite ridiculous, and I'm again too lazy to photo shoot that one (I might even sell it). But stay tuned for my exciting Xevoz Challenge coming tomorrow or the next day. 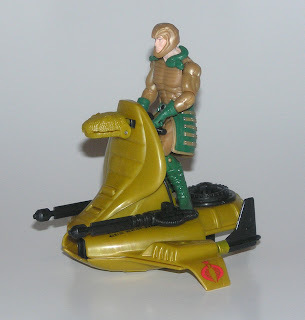 Serpentor does not look like he is enjoying the ride on his new/old Air Chariot. He almost looks like someone on a motorized scooter, on his way to deliver a pizza. 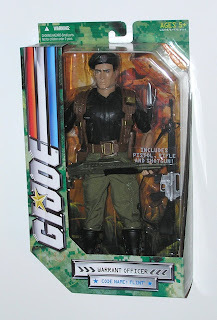 It's funny how Hasbro is trying to cram these some what larger GI Joe's onto older vehicles meant for smaller figures. Don't get me wrong, I'm hyperactive that these vehicles are being release. We all saw my old Air Chariot's condition in post 345 or something, so its nice to have a new one again. At least they provided a Serpentor without his cape. I can't believe he would fly with that spinning lift thing so close to his feet and cape. I guess Cobra cuts costs by not dealing with OSHA. Yet we all saw the consequences of that in GI Joe the movie. Xevoz - Sky Grinder - Get a haircut! People sometimes get annoyed with Skaters in these crazy times. At work, when we are closed, Skaters come buy and do tricks on the dock. Sometimes when we are open, they try and do tricks as well, so we have to send them away. 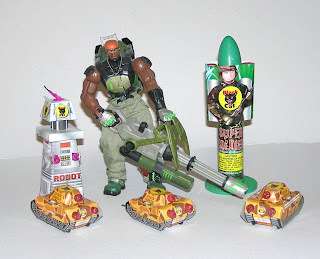 But, soon in the future, Skaters will upgrade new ammunitions, like bombs and missiles on their arms. They will fly through the sky on Afterburner Jet packs and boards. They will have swords attached to cables. They will have modified metal knuckle pounders. They will tell us to go home. Maybe I should start practicing my skills now. 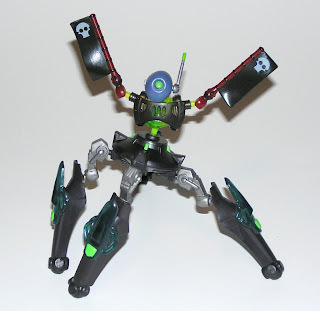 Xevoz - Bone-Cutter - Take that Insecticon! 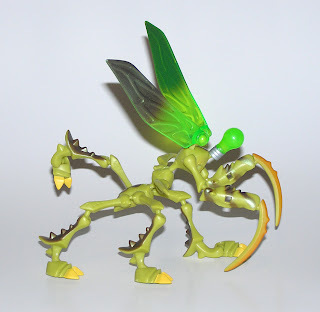 This bug is so cool, he got honors for the first toy ever to appear on the Toy Museum's Header. 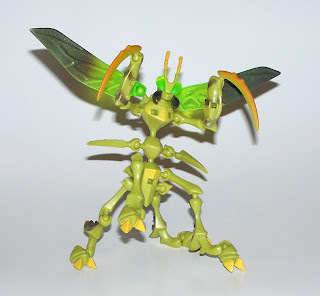 Bone-Cutter is simply the best insect/praying mantis figure ever made in the history of bug making! Plenty of joints, appendages, legs, heads, wings, hands, weapons, shields, this guy never gets boring. If you were a bug that had a light bulb head, where would you go? 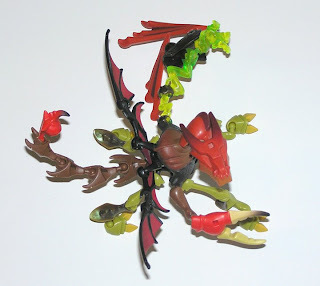 Xevoz - Hemo Goblin - Eh? 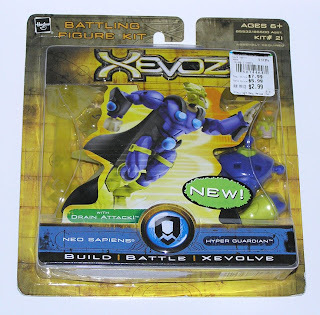 Xevoz Hemo Goblin is one of my least favorites. It's missing something, maybe the wings are too small? The heads that it comes with are blah? Missing a tail? All that, or I have never been too big into Vampires. 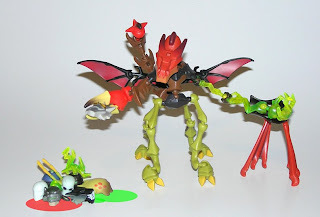 Xevoz - Preda Crawler - Too Creepy! 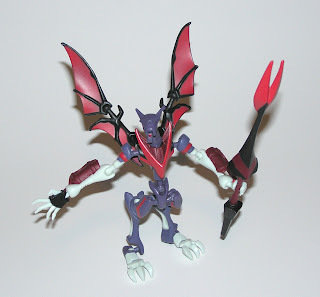 I don't allow myself to play with Preda Crawler from Xevoz, it is too creepy. 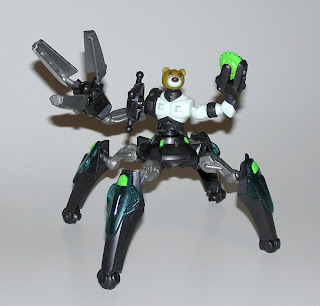 Four Legs, half man half robot, evil hand saw arm, strange claw arm, teddy bear head. Just too scary for my Museum. Don't believe me? How about if its bleeding from the mouth, while crawling around on the ceiling with a baby head in its claws? Xevoz - Moon Stalker - Woof woof! Moon Stalker almost looks like the half wolf that cornered Bart the other day, and that triggered Bart to bite me really hard when I rescued him. Ahhh nature. 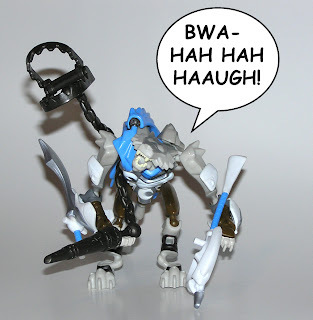 With the jointed mouth, Moon Stalker always looks like he is laughing. 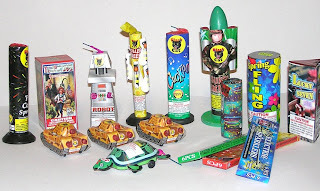 So this is what 20 bucks of fire works will get you in 2008. Check back to the toy museum in 20 years to see how inflation works. 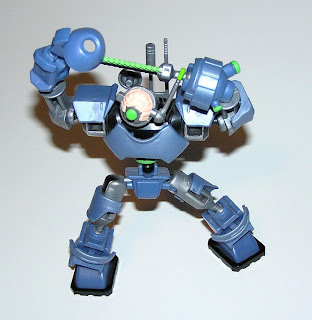 This years Heavy Duty's picks are a Robot, some mini tanks, and of course a Super Soldier. Super Soldier burned, because the back panel graphic came unglued and immediatly caught on fire. 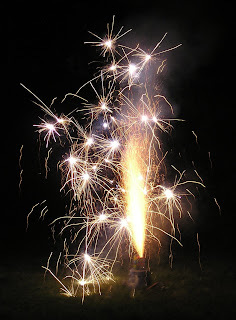 Whooo pretty stock fireworks picture. 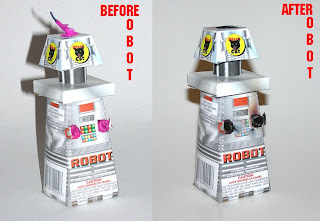 Ah, and a before and after Robot shot. I was hopping he would have more battle damage. I might have to burn him more. Xevoz - Hyper Guardian - Sticky! No really, Sticky! First off, Happy Fourth of July. This country rocks, don't let anyone ever say otherwise. Hyper Guardian will serve and protect while Superman takes a day off. So I got this Hyper Guardian today in the mail. I wasn't sure if I would really like him or not, kind of thought the makers could do the super hero better. The color scheme wasn't the best, even though I do like blue. I wish it had a customizable color palate, and better heads sculpts. But, once again, out of the package this Xevoz hero tips the top five. By the way, did you see that price someone got it for at retail?!!! 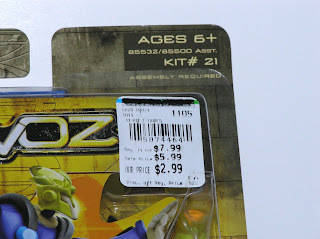 I never got lucky finding Xevoz in clearance bins. I remember a few at Toys R Us, and Target, but once they were off the shelf, they were gone forever. 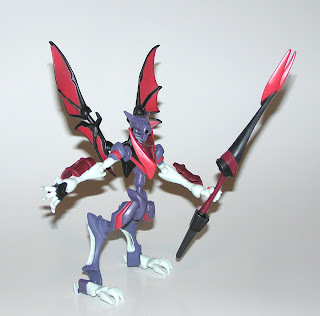 (I have memories of picking up Storm Wing for my old roomate- turns out that was the rarest Xevoz of them all- DOH!) Unfortunatly for me, I had to pay many many multiples of that 2.99 for my Hyper Guardian. Now this was kind of funny or strange. The previous owner must have left these in a hot attic or garage. Or the plastic was never up to par. All of the Hyper Guardians clear yellow weapons, blast effects, and accessories were really sticky! The package was never opened before, so it must have just sat and degraded or the plastic corroded. It was almost a film of really thin glue. But with a little warm soapy water, and a soft nail brush, I was able to clean it off. Now the parts shine again. I just wonder if the film will come back now, but probably not if its out in the air. Have fun blowing stuff up today. 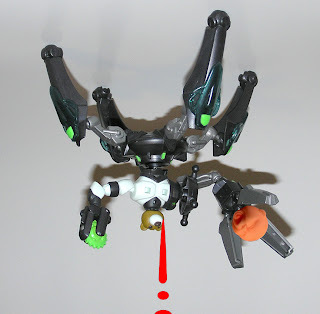 And remember, unlike Xevoz, if your arm blows off, you cannot reattach! 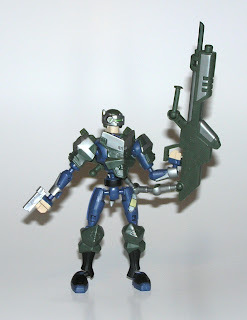 Xevoz - Sledge Trooper - Brainy! Sledge Trooper my trusty work desk companion. It has stayed longest out of all rotating desk toys. It has survived many a battle, and many a challenge. 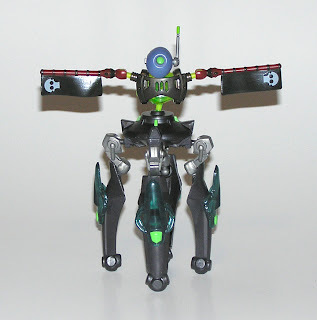 Truely one of the top five Xevoz, and one of the all time best Robot toys ever made. 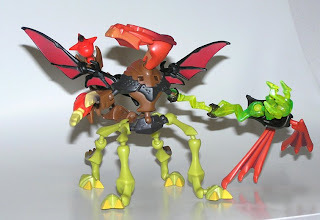 It has several arm attachments, pretty blue armor, and an eye for green. Also one of a few Xevoz with projectiles. When no one is looking, it opens up its helmet and lets its brains air out. Xevoz - Shock Berserker - Tall dude! Believe it or not, this is the guy powering the inside of your mouse this very second! Shock Berserker is definitely a top five Xevoz design (maybe someone should check if I went over five by now? I hope a have a few spots left). 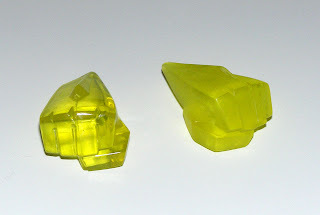 This electric dude has some spiffy nice clear yellow and green plastic proving you can make toys in yellow and green clear plastic. 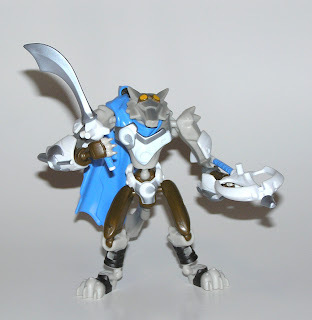 It has an assortment of weapons including shock staff, shock sword, shock armor, shock helmet, and a magnet. Shocking. Shock Berserker is also a pretty tall Xevoz. 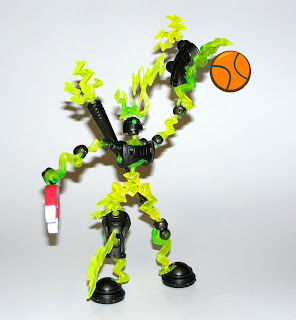 He hopes to make the Toy Olympic summer basketball team.